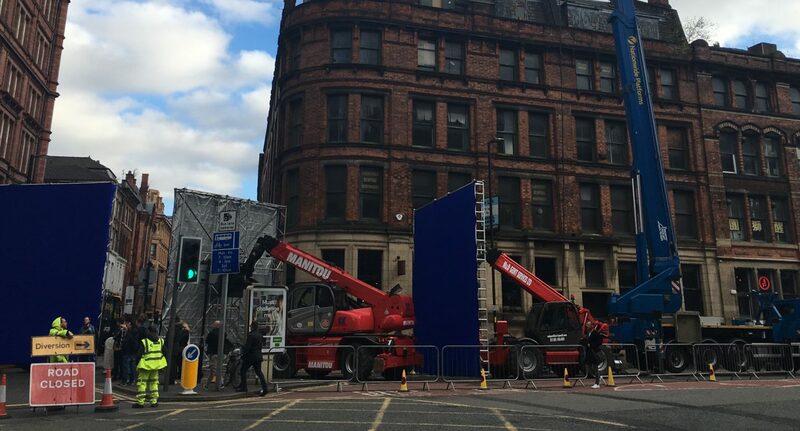 Sections of Manchester’s Northern Quarter have been shut off from the public this week for the filming of Morbius, a new Spider-Man spin-off movie. The film follows a biochemist who, upon attempting to cure himself of a rare blood disorder, accidentally infects himself with a form of vampirism. Set for a 2020 release, Morbius will star Jared Leto in the namesake role, Doctor Who’s Matt Smith and Puerto Rican actor Adria Arjona. David Bradley, who portrayed Argus Filch in the Harry Potter series, has also been spotted on set in Manchester. The Marvel picture appears to be set in New York, with the city centre area being transformed to look like Spider-Man’s hometown. Northern Quarter streets remain laden with yellow American-style traffic lights, New York street signs, and fire hydrants. Passers-by have so far been able to spy stunt performers elevated high in the air, yellow New York taxi-cabs, and graffiti art depicting characters from the Marvel world. Huge blue screens used for special effects have been erected besides the sets. Throughout the shooting, hundreds of Mancunians and film fans have gathered around the Port Street and Dale Street sets in an attempt to catch a glimpse of the action. Smith will join the cast as Morbius’ best friend Loxias Crown, with Arjona playing his fiancée Martine Bancroft. Dr Michael Morbius first featured in the Marvel comic The Amazing Spider-Man in 1971 as Spider-Man’s rival, after the Comic Code Authority lifted a ban on the depiction of vampires. Morbius will see the title character adjust to his new-found superhuman abilities. Morbius is the second film of Sony’s Marvel Universe, a new franchise adjunct to the Marvel Cinematic Universe of which 2018’s Spider-Man: Homecoming is a part. The first was Venom, released last year starring Tom Hardy. A crew member could be seen spray-painting Venom’s face on a wall on Port Street on Tuesday. Whether Hardy will revive his character in Morbius remains unclear. Mobius is not the first Marvel movie to be filmed in Manchester. In 2010, the Northern Quarter was transformed into 1940s Brooklyn for the shooting of Captain America: The First Avenger.